File this one under “unsolved mysteries,” an incident that has confounded researchers, as well as ordinary people, for over a century. 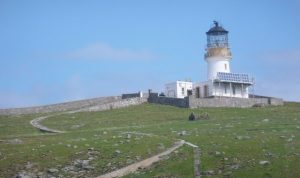 How did three lighthouse keepers on Eilean Mòr, site of the Flannan Isles Lighthouse, vanish one day without a trace? Eilean Mòr is one of the Flannan Isles in the Outer Hebrides, located off the west coast of Scotland. The difficult but necessary task of building the lighthouse occurred between 1895 and 1899. Materials had to be hauled up cliffs that rose nearly 150 feet, off supply boats whose crewmen struggled with the roiling waters of the Atlantic Ocean. But the job got done, and the lighthouse began its function of warning ships away from the dangerous rocks surrounding the island in December of 1899. 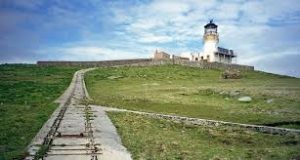 The Flannan Isles Lighthouse, like many others in the Outer Hebrides, was tended to by three men, with a fourth rotating man for backup in the nearest coastal town. In December of 1900 the six-week shift would be covered by Thomas Marshall, James Ducat, and Donald MacArthur. These experienced lighthouse keepers did not anticipate any problems, other than dealing with the storms that were so prevalent in the Atlantic at that time of year. The light would be functional every night, and during the day in lousy weather, as usual. But such was not to be. On December 15th a steamer from America on its way to Leith, Scotland noted that, despite poor weather conditions, the light atop Eilean Mòr was not operational. When they docked in Leith three days later they reported this to the Northern Lighthouse Board. A relief vessel, the Hesperus, was ordered to see what the problem was on Eilean Mòr, but by this time the weather had gotten even worse. The Hesperus did not reach the island until December 26th. Once in sight of the island the captain of the Hesperus noticed a number of ominous signs, the most troublesome being that none of the keepers were there to greet them, something that they always did. The captain fired a flare and blew the ship’s whistle numerous times but received no response. The three ill-fated lighthouse keepers, with Superintendent Robert Muirhead (r). The backup keeper, Joseph Moore, managed to go ashore in a small boat and hike up to the compound. The entrance gate and the door to the keepers’ quarters were both shut. Inside, he found the beds unmade. He called out to the men but was met with only silence. Nothing seemed amiss, other than a single overturned chair. Despite continuing searches, no bodies ever turned up. The media, what it was at the time, printed all sorts of speculative and crazy stories. Many believed that the crew of a ghost ship had overrun the island. Others thought a sea serpent (the Loch Ness monster?) had taken the men. Some said that the keepers had hired a ship to take them off the island to begin new lives. But at least two of the keepers were happily married family men. There were even those who blamed “foreign spies” for abducting them. Tracks leading up to the lighthouse on Eilean Mòr. 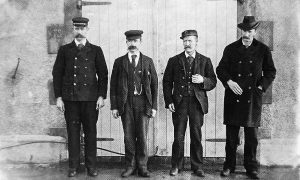 Did this report put closure on the disappearance of the three lighthouse keepers? Not really. Future theories abounded, right up until present day, as I’ll explain in a moment. Some said that Donald MacArthur was a hot-tempered man, that the three men fought near the edge of a cliff and fell in. Or maybe he went off the deep end, killed the other two and followed them into the sea. But some modern theories insisted that the incident was the result of paranormal activity. This included abduction by aliens. Scoff as you might…but as an “unsolved mystery,” who is to say it didn’t happen that way? Without getting too detailed, this version posits that the three men go out to check on things after a nasty storm. Looking down from atop a cliff they see a skiff, a man’s body, and a large chest that has been washed into an inlet. MacArthur is lowered down to investigate and, as the others haul up the chest, he is attacked by the man who had been presumed dead. In self-defense he kills the guy, and they dispose of the body. The lighthouse keepers know that trouble is on the way. Marshall insists that they do not open the chest, but later on he does it when he’s alone. Guess what, the chest is full of gold. Can you see the conflict already establishing itself? And wherever the dead guy and the chest came from out at sea, you’d had to guess (rightfully so) that others will soon be showing up on the island to reclaim what they believe is theirs. 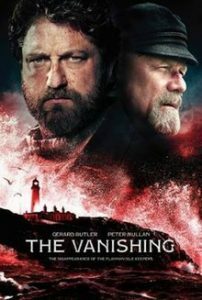 I enjoyed The Vanishing, which resonated with critics, for its solid tension and fine acting. 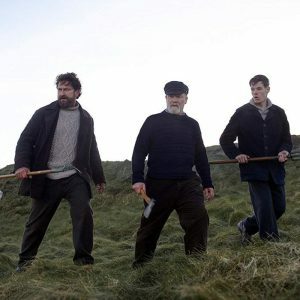 More important, it illustrates that, over a century later, the mysterious disappearance of the three keepers from the Flannan Isles Lighthouse is still relevant.